In December I was contacted by John Lepp of Agents of Good to do an illustration for Interval House, a battered woman's shelter in Toronto. John wanted to give the feeling of a warm home and a safe place for woman and their children. 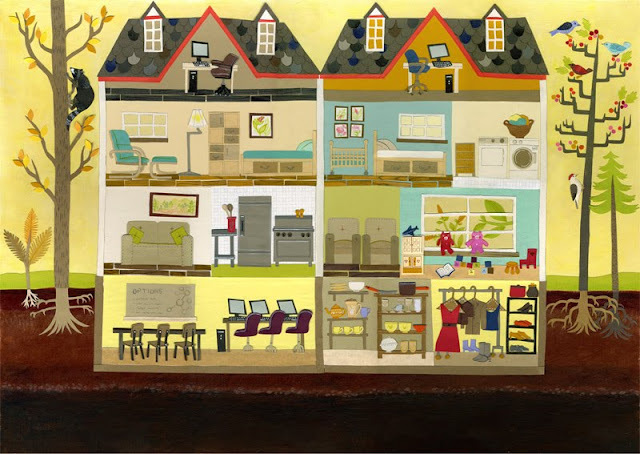 He asked me to create a dollhouse illustration, loosely based on photos and floor plans of the home. The full image is featured on the cover, and crops of the rooms are reused inside the report. In addition, I created a cut out alphabet that is used to highlight text in the report. As well as two pie graphs. John did an amazing job on the design and text in the report and it was a real pleasure working with him! 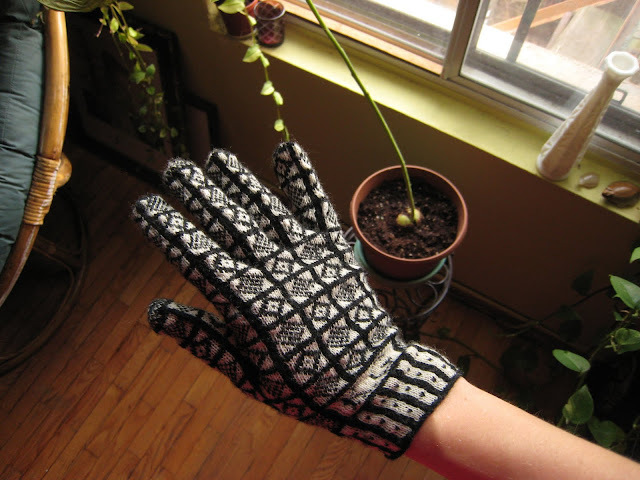 So, as promised, I've been knitting up a pair of gloves for myself! The Sheppard's Plaid, Sanquhar patter has been a nice change from the Duke. I've now finished the right hand glove and it fits perfect. My tension is getting better with the 1.5 mm needles and lace yarn. 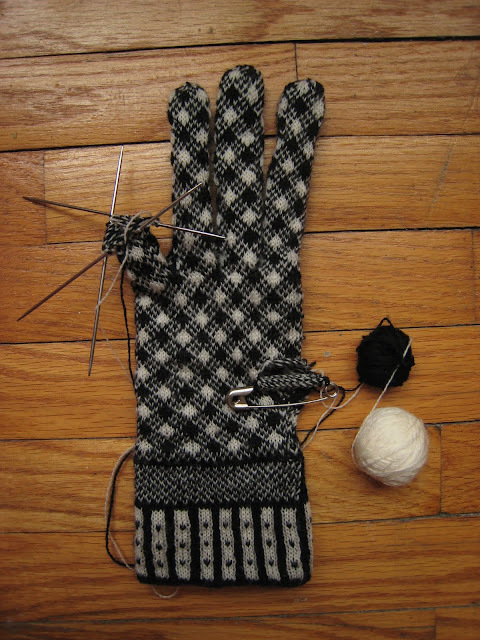 Here's a picture of the right hand glove in the near completion stage. I like the look of it with the needles still in it. My first lady-sized Sanquhar gloves are complete! This are for my sister, so they are sporting the initials K.G. I used merino lace yarn on 1.5 mm needles. This Sanquhar pattern is called the Duke. This seems particularly appropriate for my family, as my Nana's maiden name was Duke. Now I think I'll knit myself a pair, but in the Shepherd's Plaid pattern! My Dear friend Shawn had himself an old man party last night. 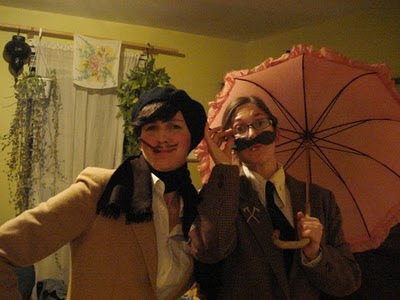 For the occasion, my roommate Erin, and I dressed our best. 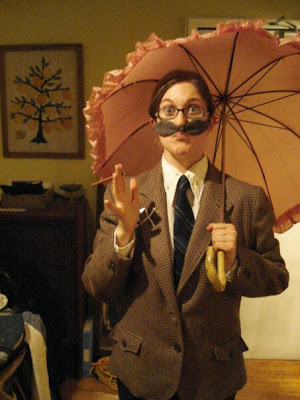 She leaned more towards the smarmy duchey side, while I was more the bumbling professor type. I knit myself up the mustache based on this pattern I found online. However, I was hopless at reading and following the instructions, so I just got the gist and knit it up using my own brain powers.